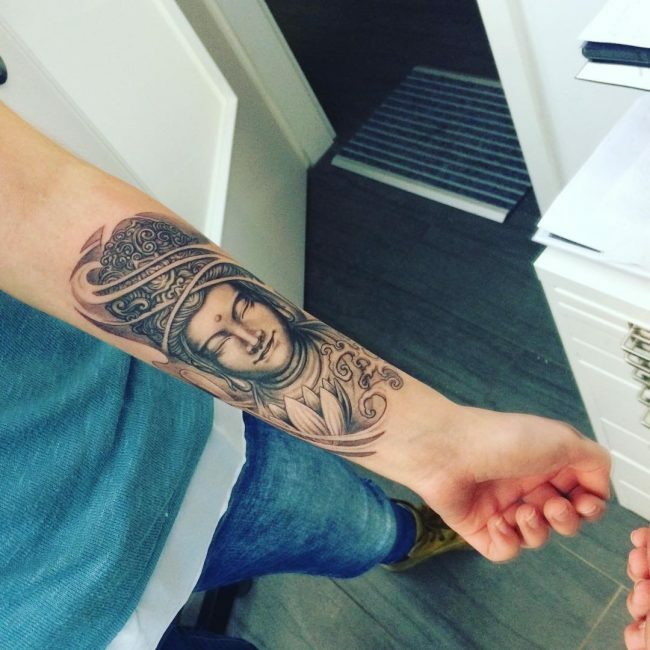 Buddhism is more than a religion. 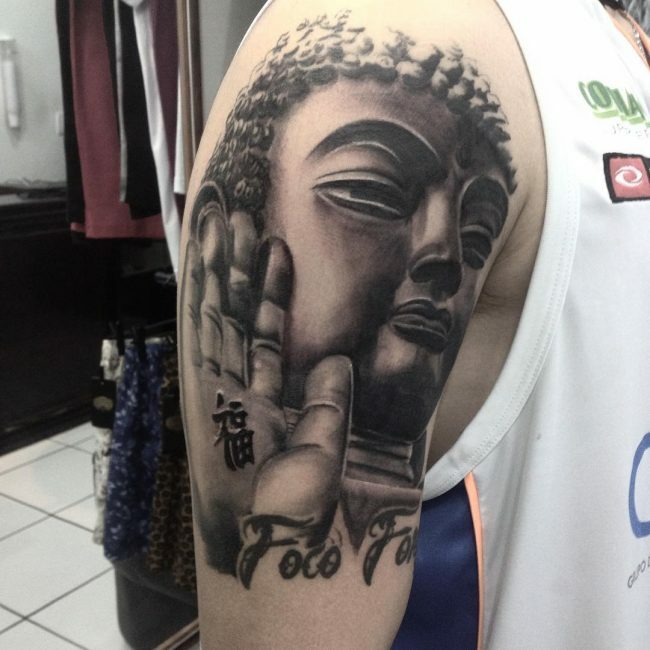 It is a life philosophy that teaches tolerances, wisdom, and patience. 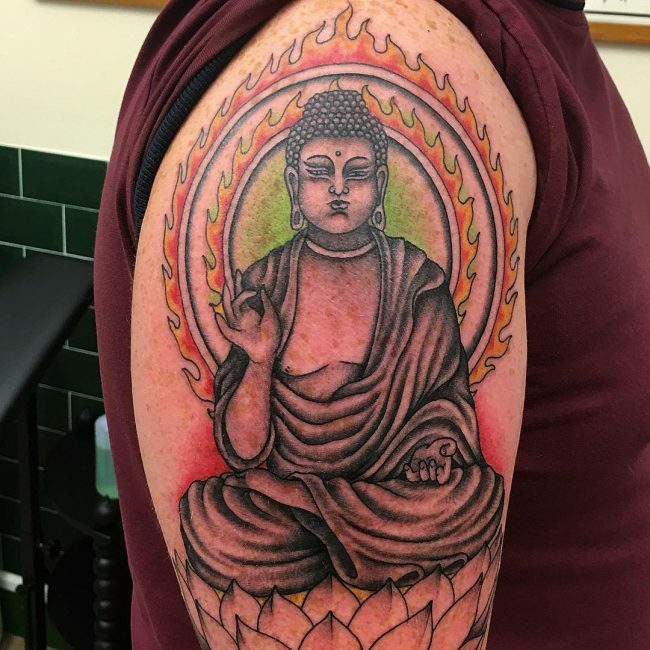 In a world of fierce religions that seek to convert others, Buddhism stands alone. 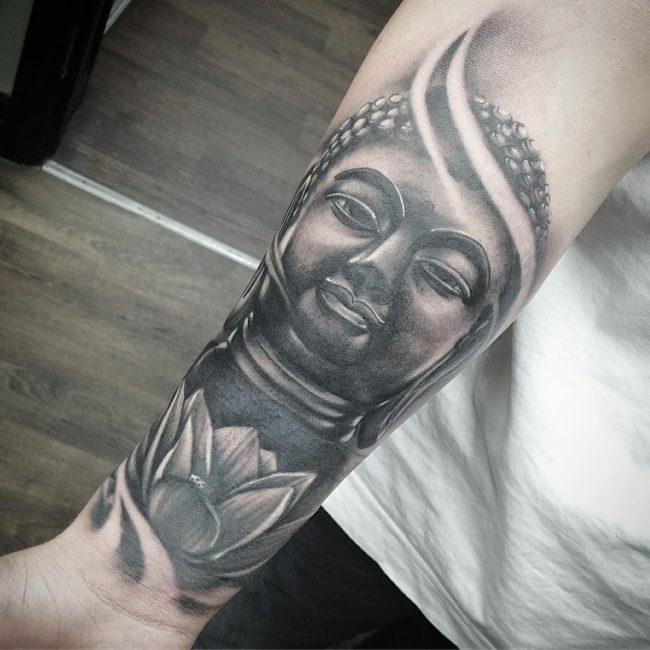 A Buddhist will never try to convert someone else to their belief, hence why no wars have ever been fought in the name of Buddha. 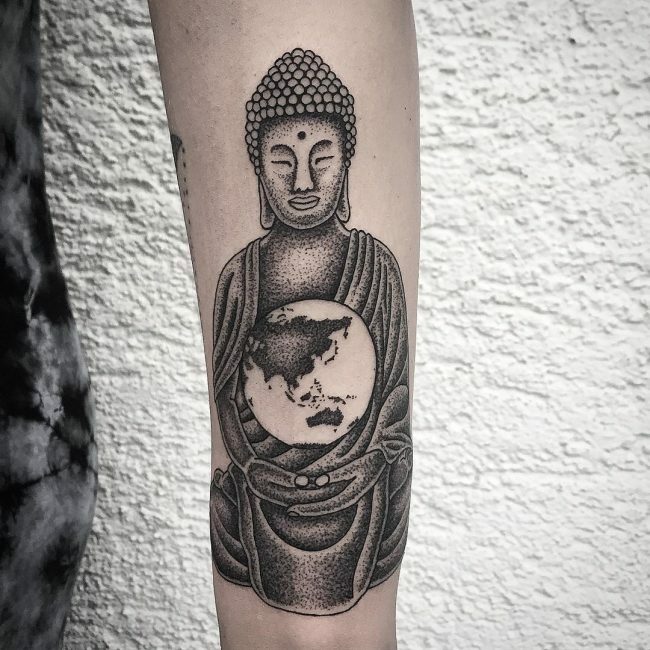 It is the fourth largest belief system in the world, followed by more than 450 million people and although it is primarily an Eastern religion it’s following in the western world is steadily growing. 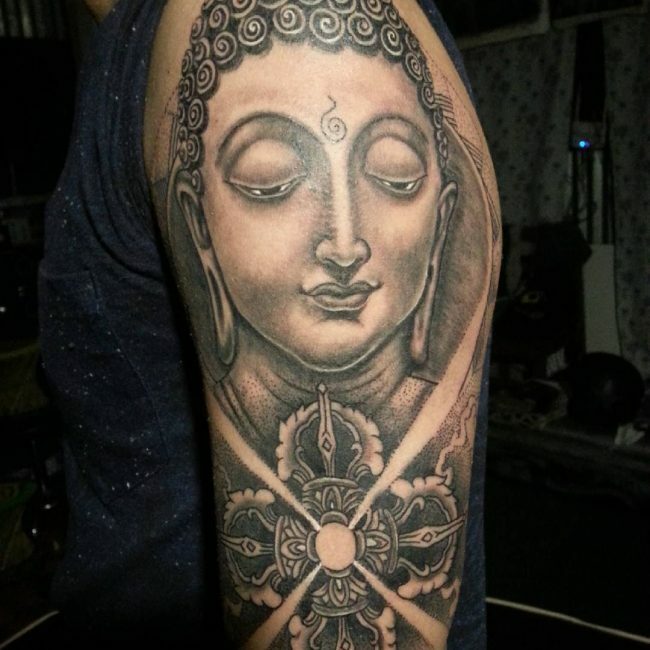 The word Buddha is a title; it means “he who is awake”, meaning someone who has found enlightenment and nirvana. 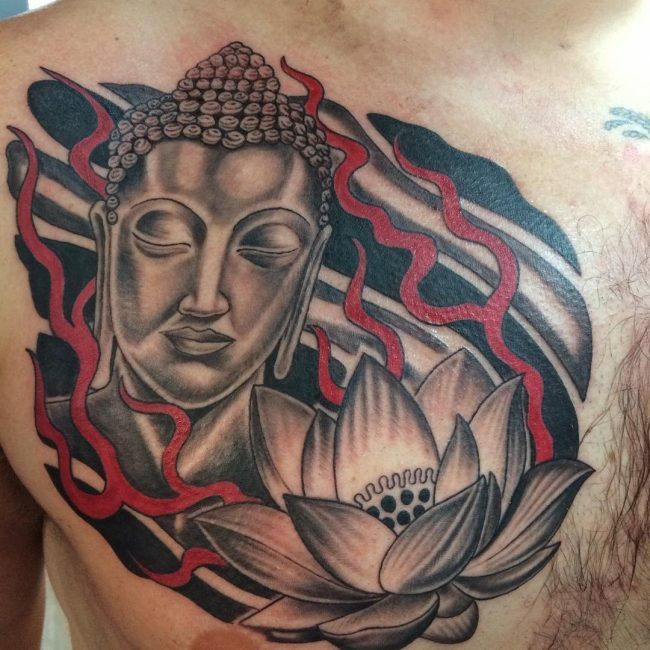 And as it’s following grows, so does the demand for Buddha tattoos, but who was the Buddha? 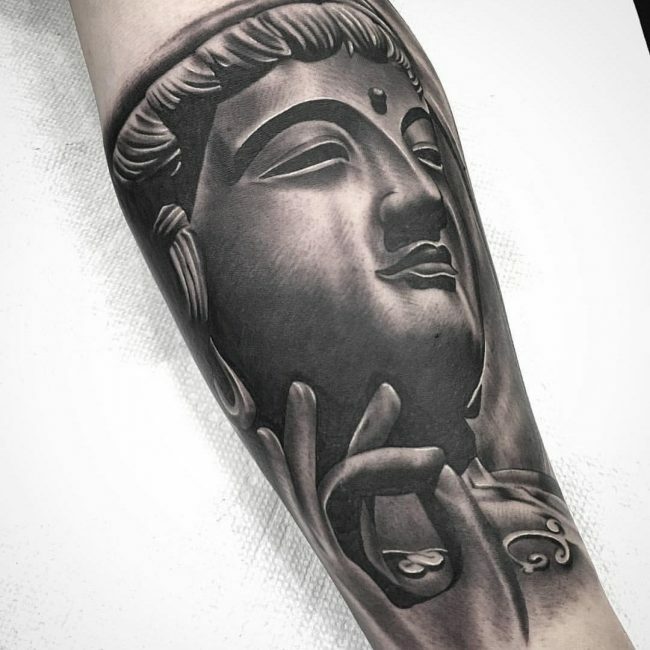 Shakyamuni (the title of the first Buddha) was Siddhartha Gautama. 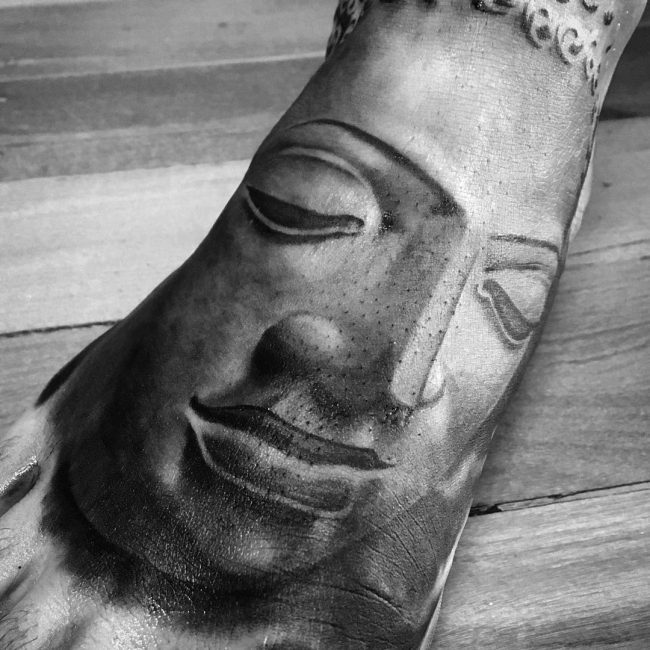 He is believed to have lived in eastern India between the 6th and 4th century BC. 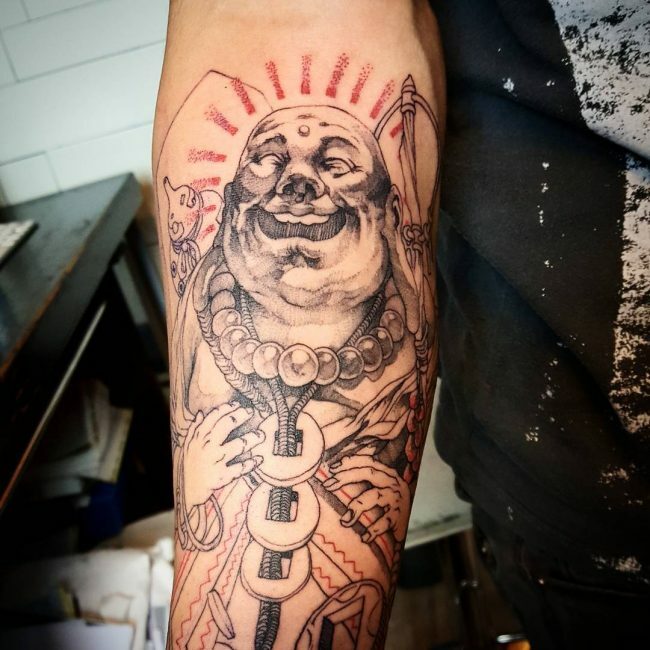 He was a prince who left behind his wealth and titles and became a monk. 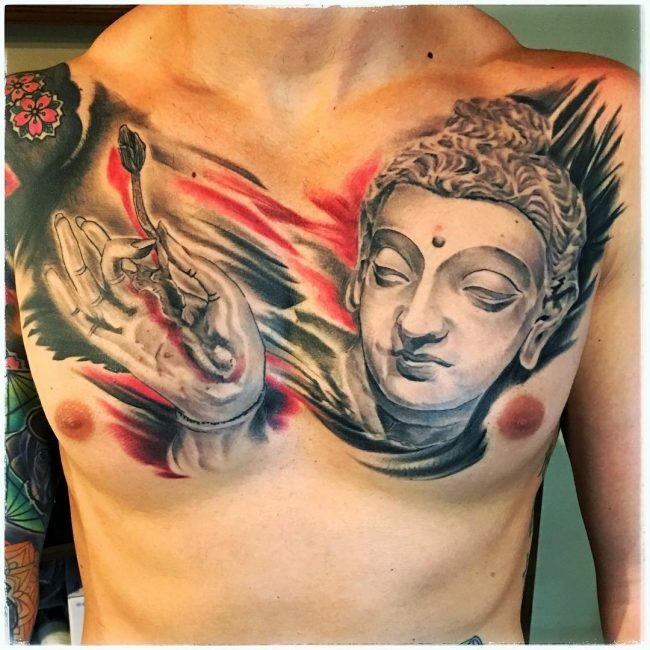 He is recognized by followers as the divine teacher, who achieved full Buddhahood after sitting under a Bodhi tree meditating for 49 days. 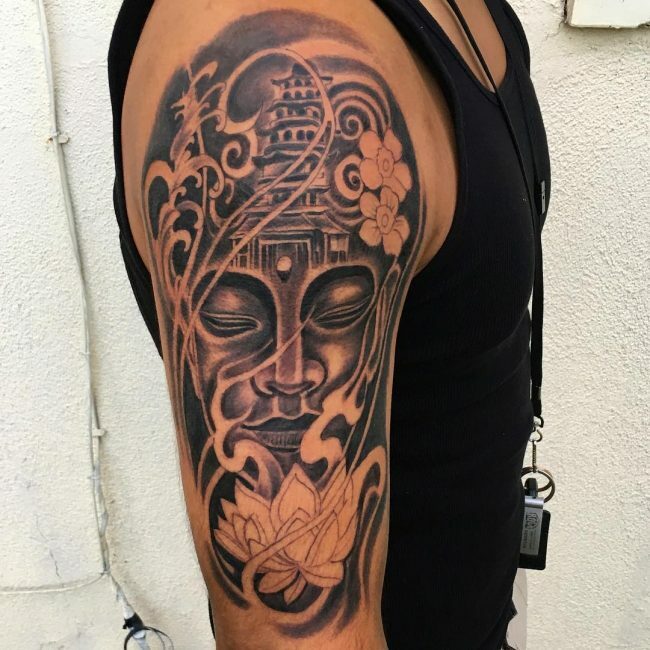 He went on to share his experience, teachings, and knowledge to help others find the enlightened path. 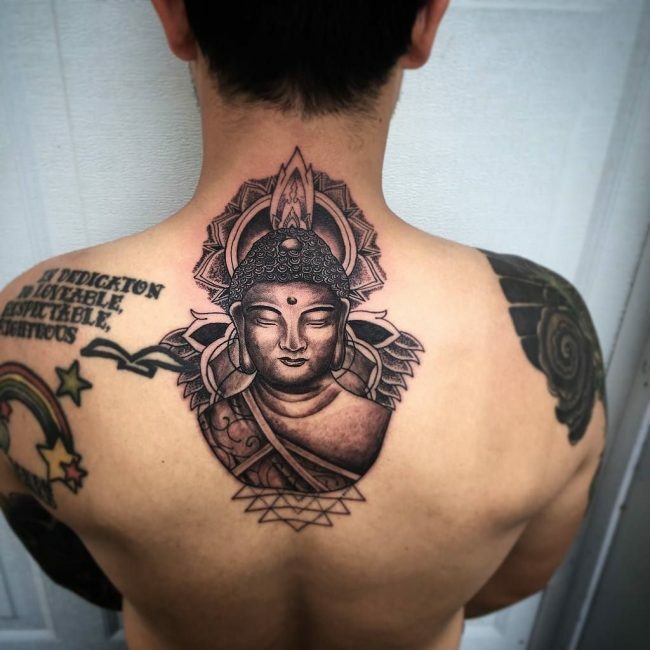 Although he did not want to be recognized as a God, his image is used to pay homage to his teachings. 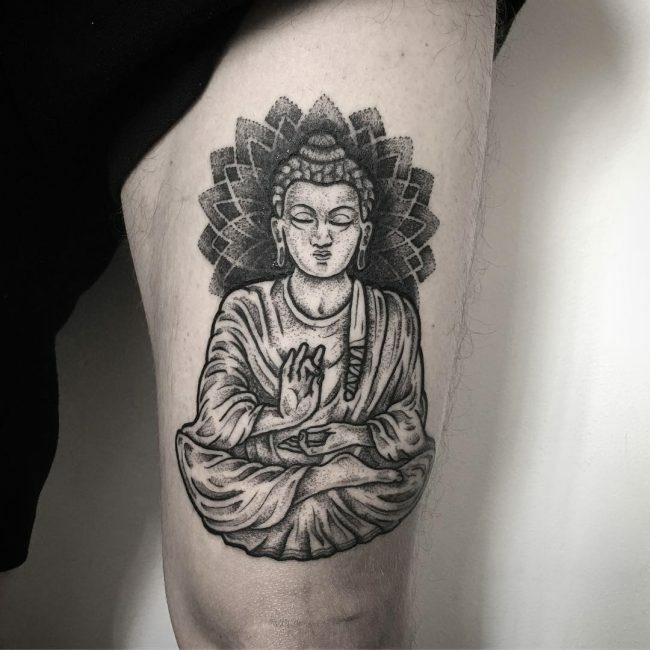 Thus many Buddhists chose him as a subject for their religious tattoos, although you do not have to be a Buddha to have such a tattoo, you just need to have an understanding of its meaning. 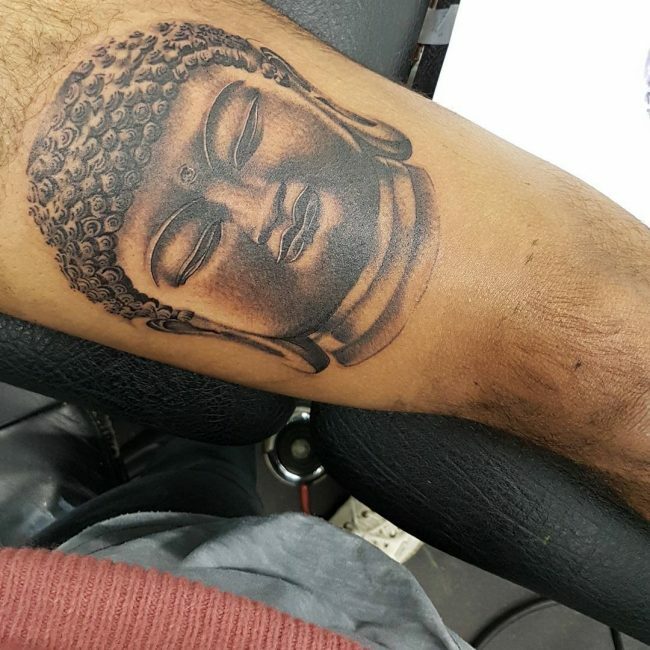 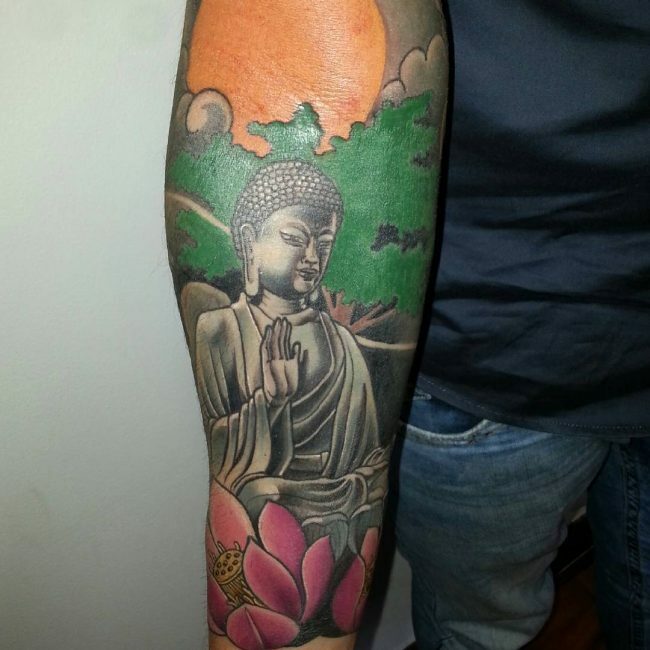 The image of Buddha in a tattoo can be used as a reminder to live life according to the teachings of Gautama. 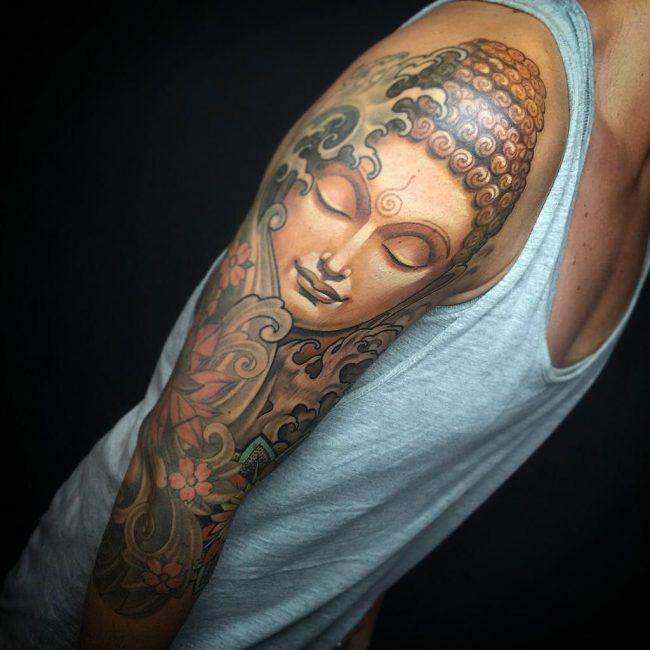 That means to reject materialism and look inward for answers and solutions. 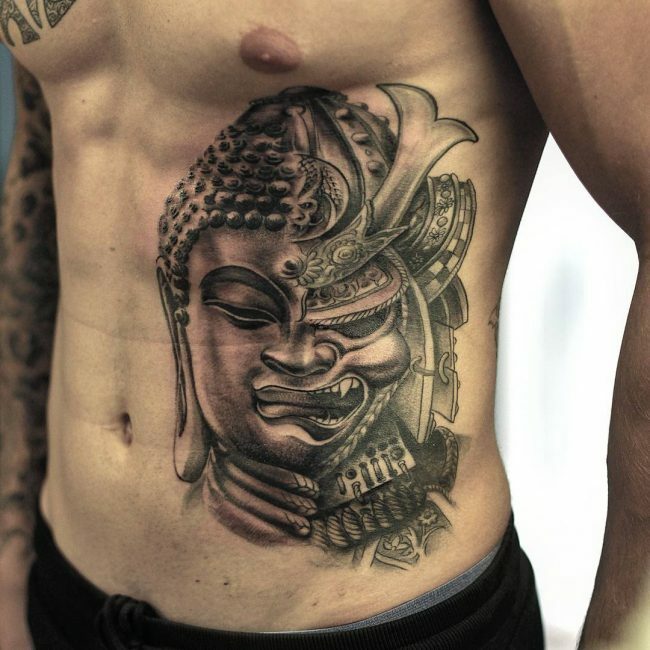 It also means to be mindful of your actions and their karmic reactions, develop wisdom and live a moral life. 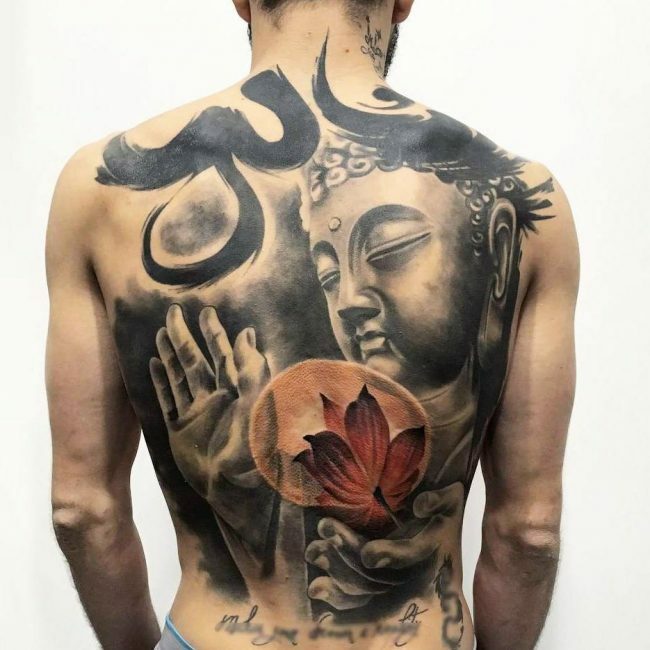 These teachings are almost universal and can be applied to any religion so once again you do not have to practice this faith to enjoy this type of tattoo. 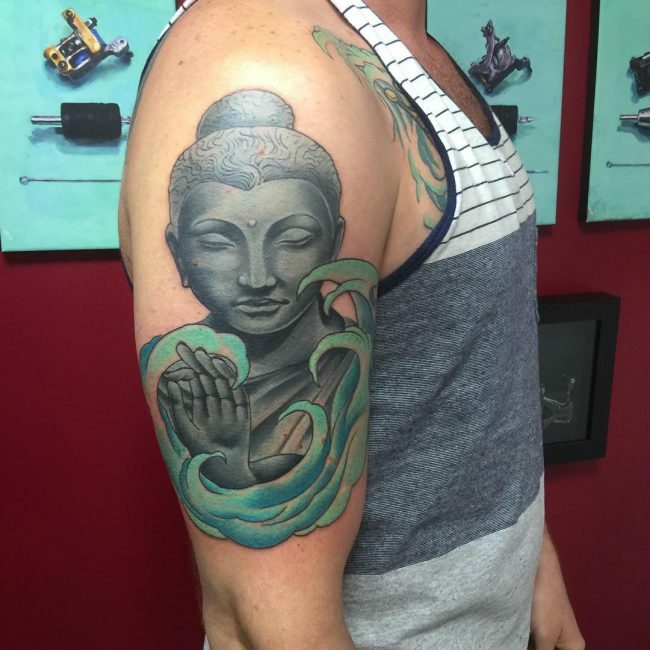 These tattoos are generally regarded as a symbol of enlightenment, good fortune, and strength. 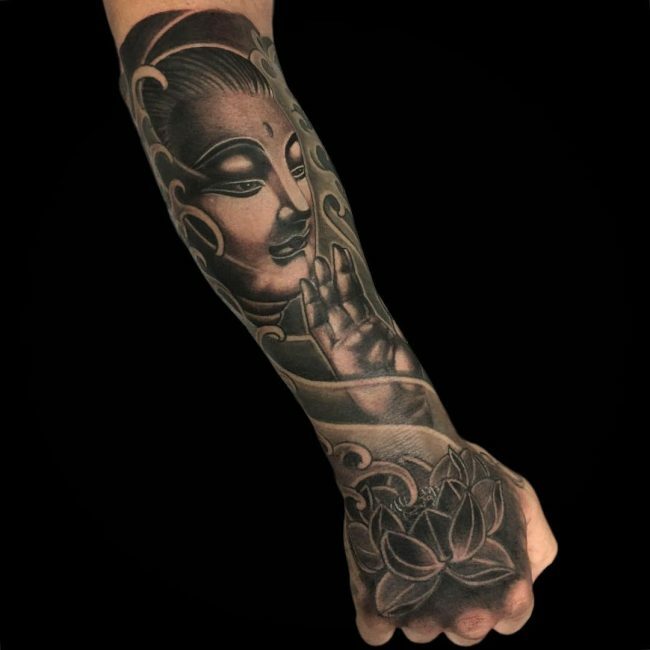 Lotus Flowers: The lotus flower is a totem of strength, renewal, and enlightenment. 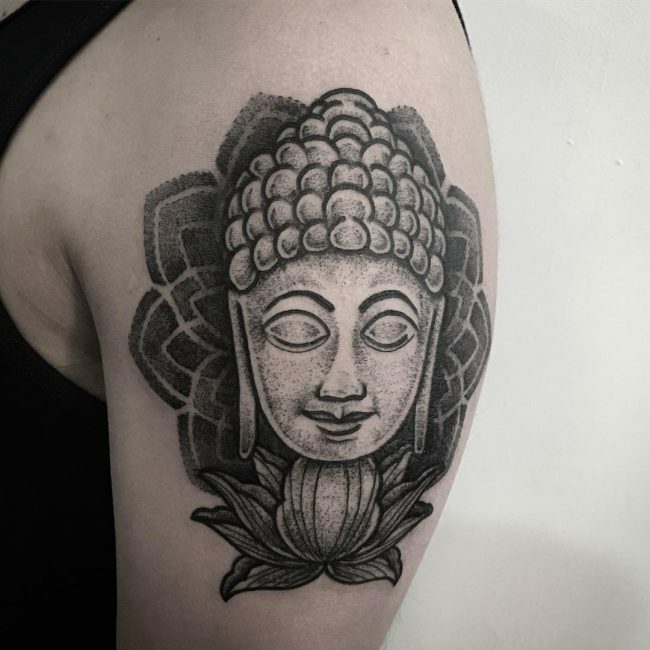 In Buddhism, the flower is symbolic of purity and detachment from wants and desires. 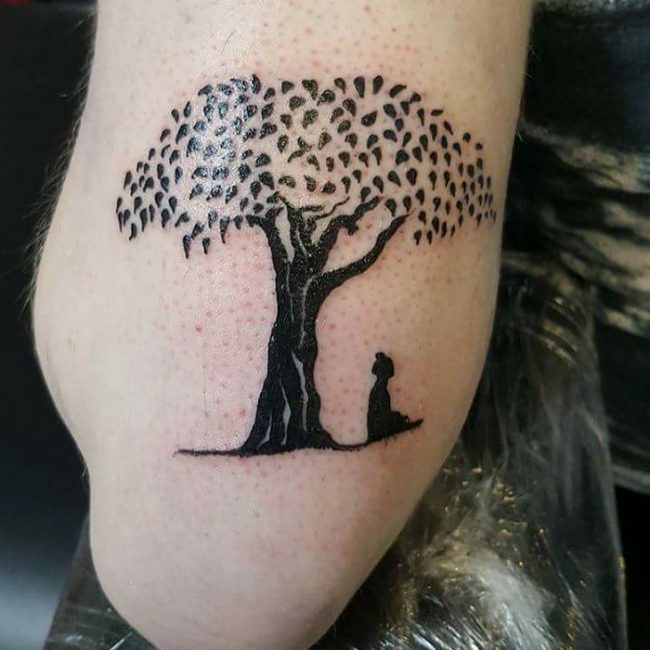 Bodhi Tree: At the age of 35, Siddhartha Gautama vowed to sit beneath a Bodhi tree until he achieved enlightenment, which he did on the 49th day. 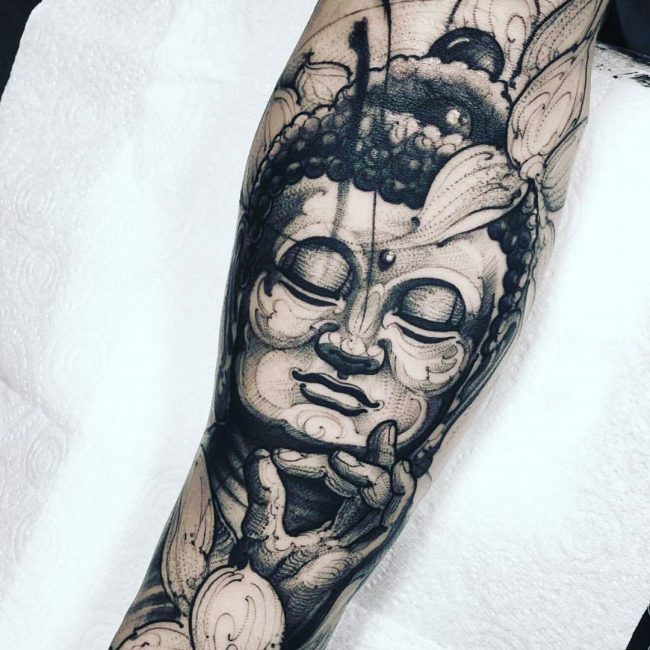 Some designs of the Buddha include him sitting beneath a tree in reference to this. 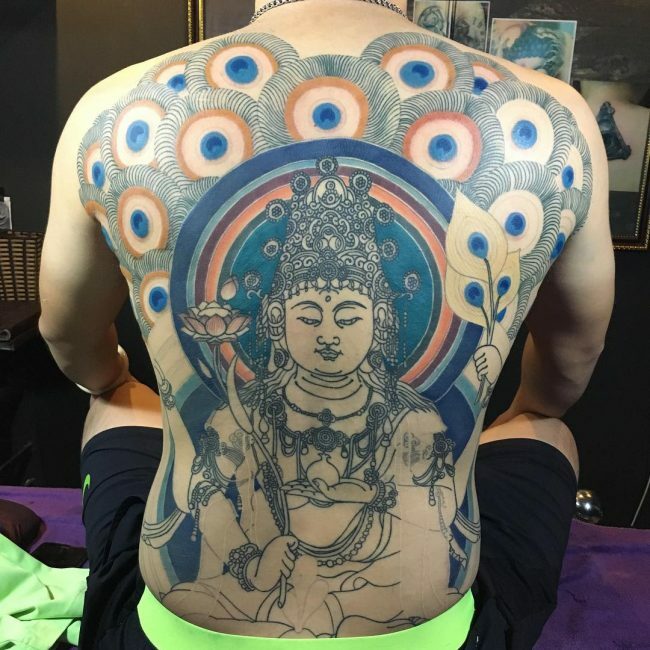 This would generally be a larger design, suitable for the back. 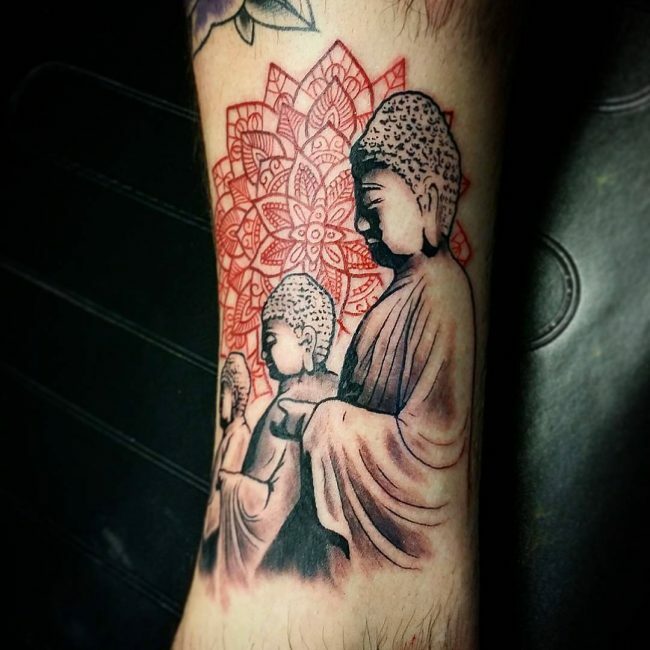 Circle of Dharma: This circle has eight spokes which represent the eight pillars of Buddhism teachings. 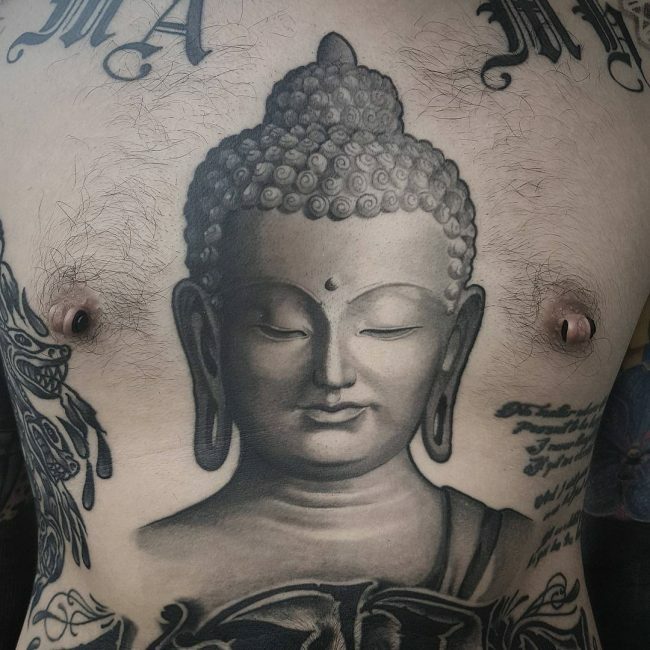 This is also known as The Way. 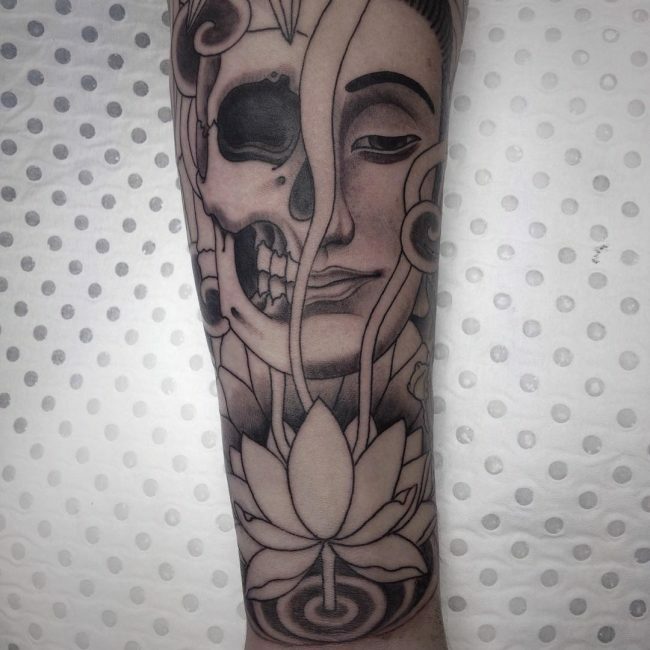 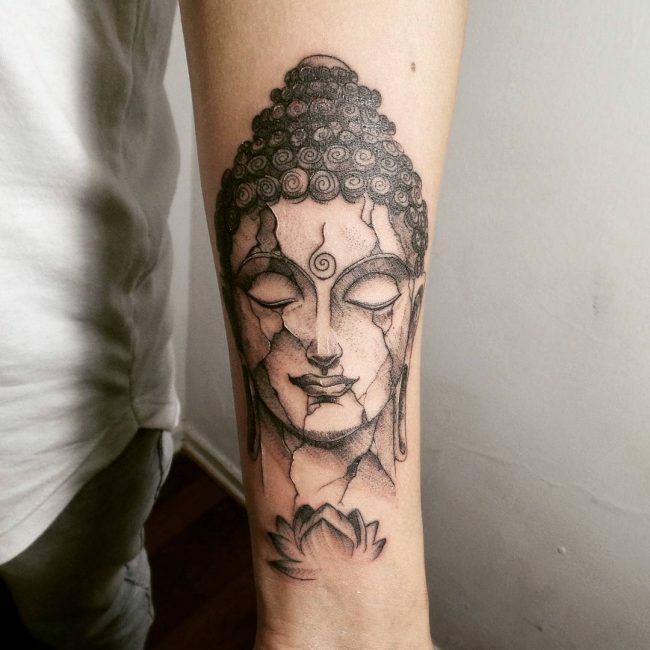 This design can work as a standalone tattoo, but also together with a Buddha piece. 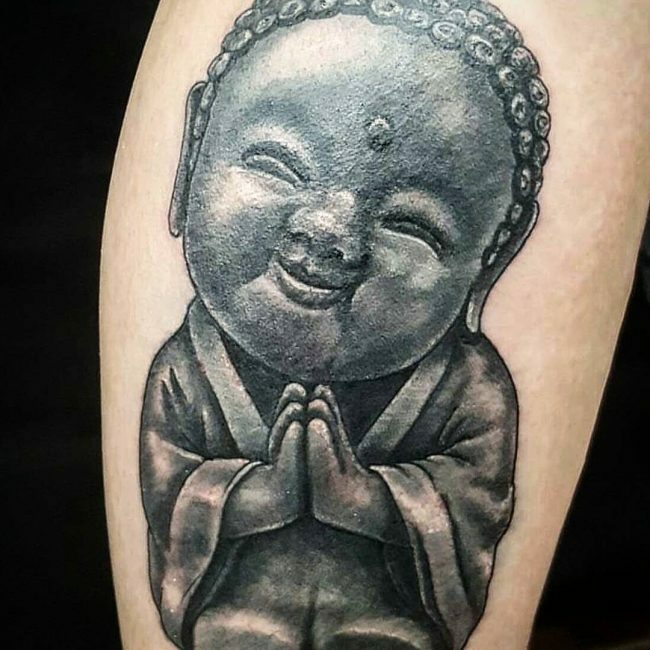 Laughing Buddha: The laughing Buddha, sometimes also known as Budai is the image of a short, bald, chubby man who sometimes carries a cloth sack. 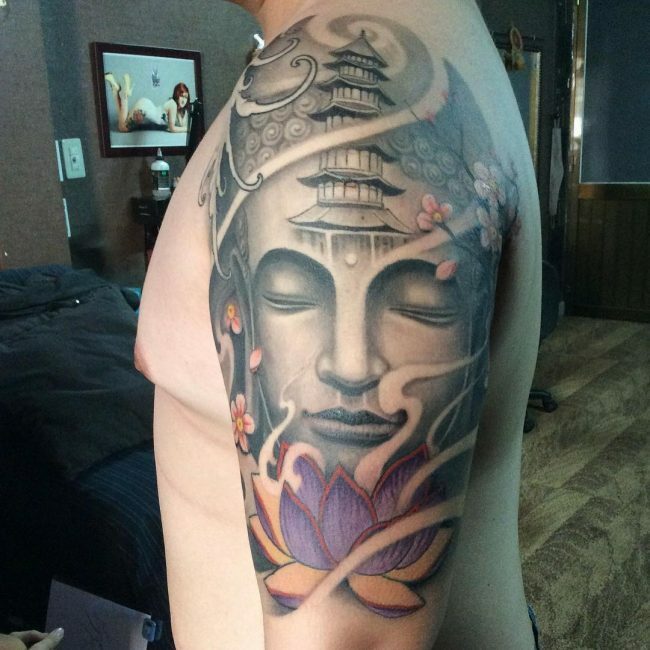 This is not technically a depiction of Buddha, but rather of someone who will achieve enlightenment. 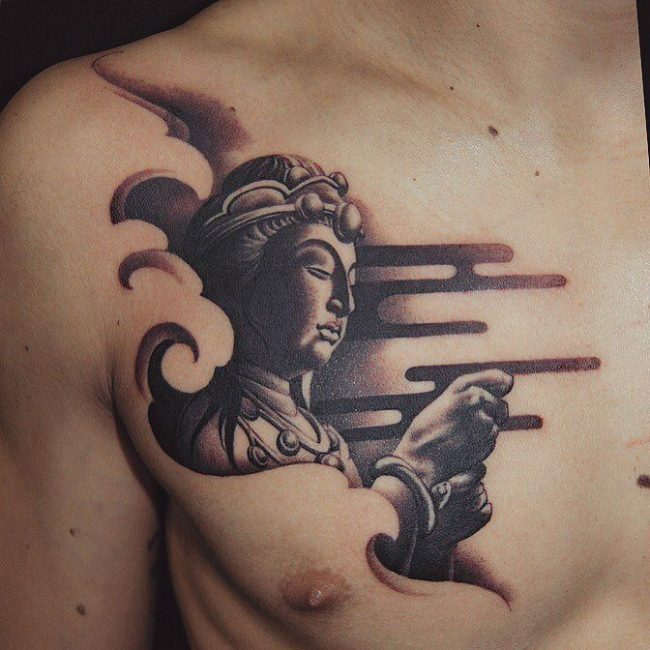 This type of tattoo is a symbol of good luck and prosperity in the future. 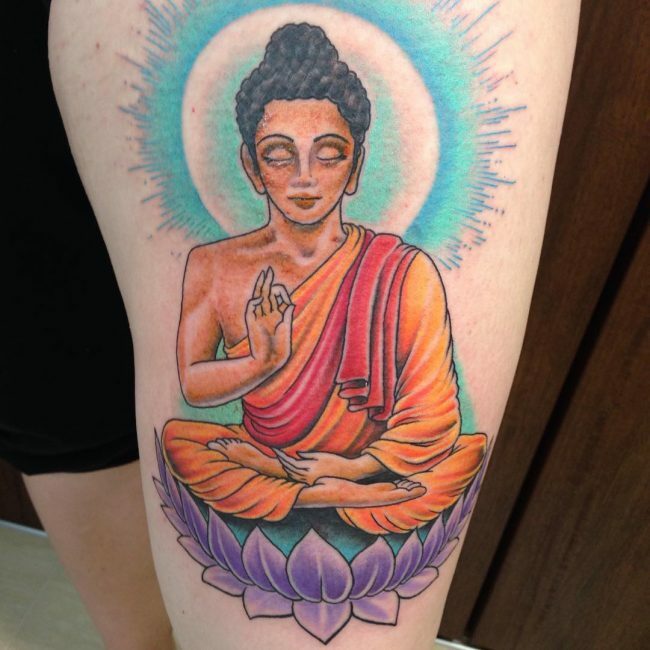 It’s a cheerful design that looks outstanding in bright colors. 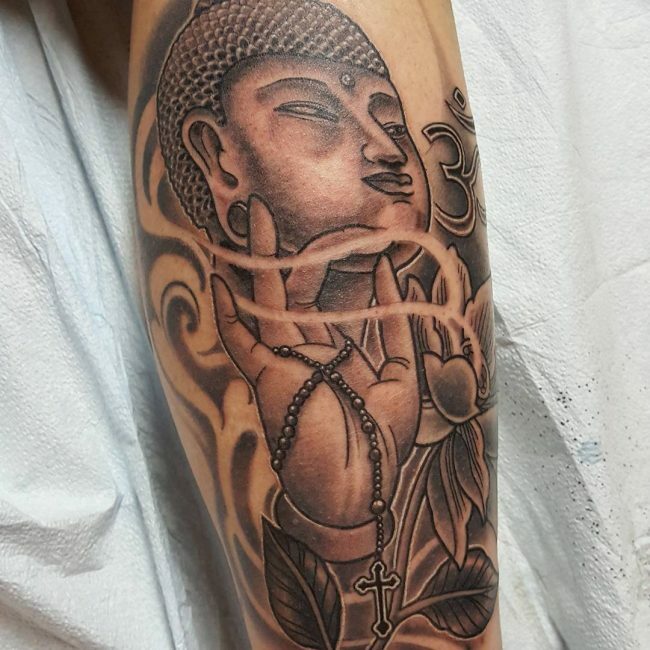 Raised Palm: Tattoos that show Buddha with his palm raised, usually show the top half of his body. 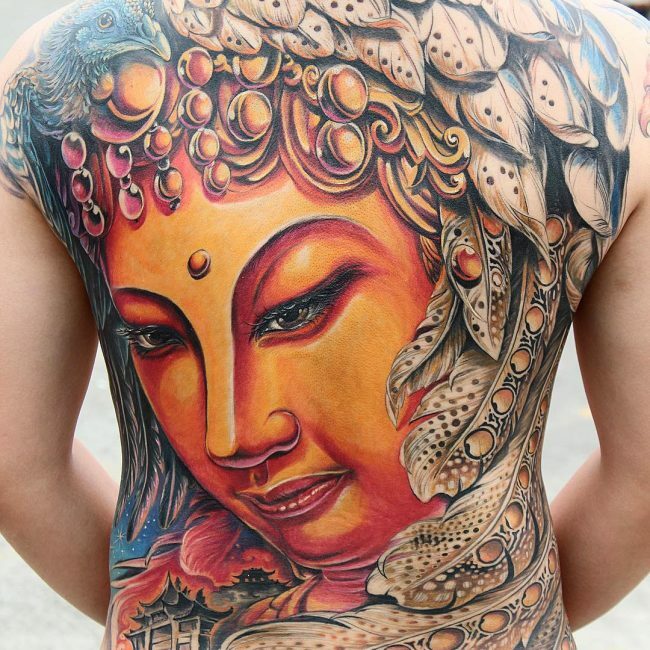 This is seen as the Buddha offering blessings. 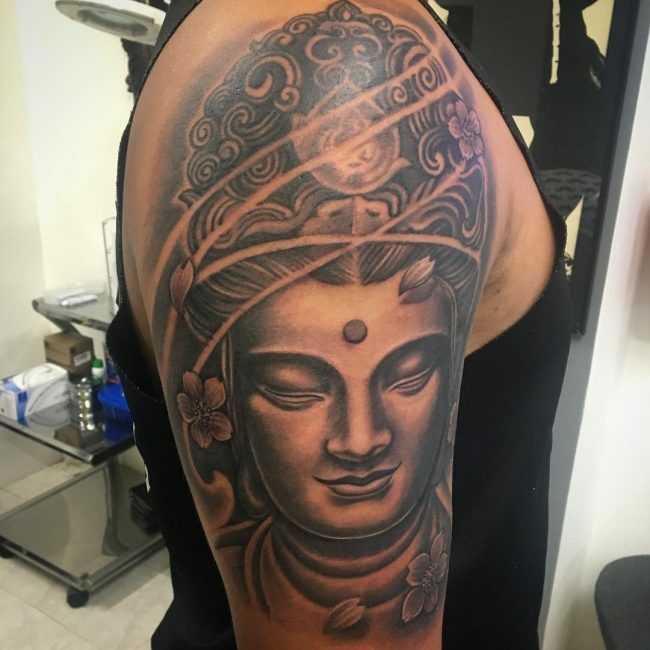 Golden Buddha: This type of design is often chosen by those who wish to express their devotion to the Buddhism philosophy and way of life. 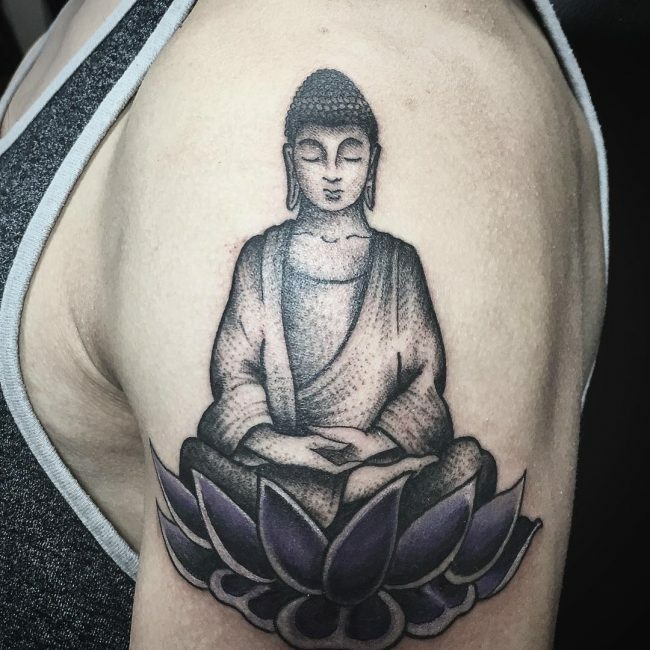 He is usually drawn in a meditating position. 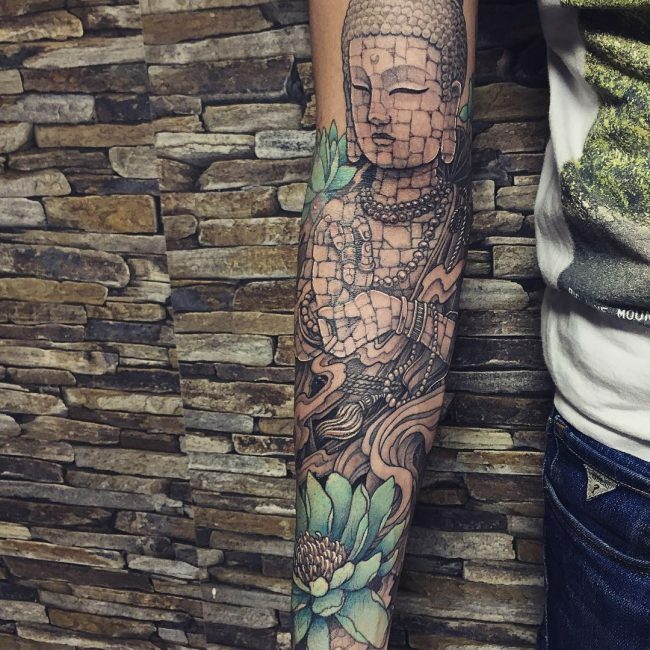 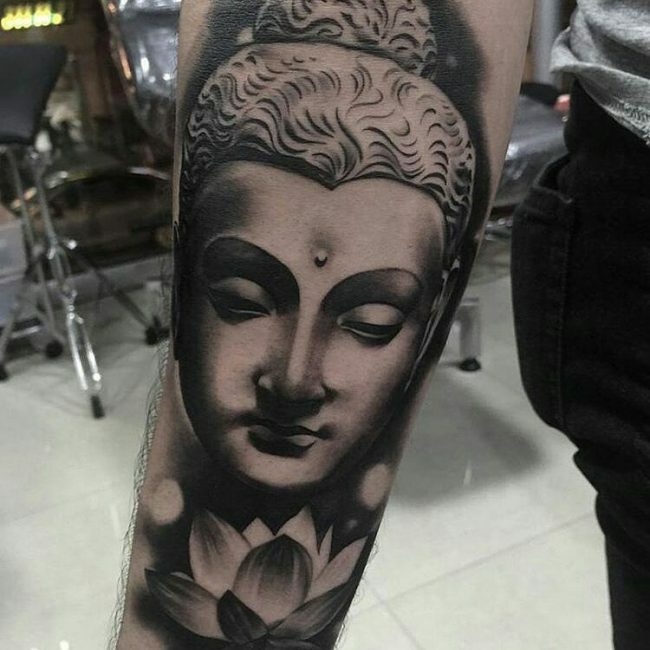 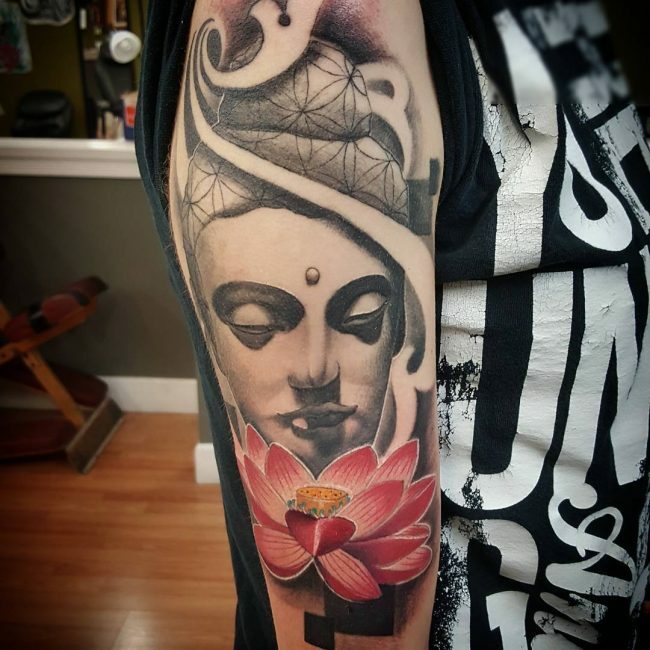 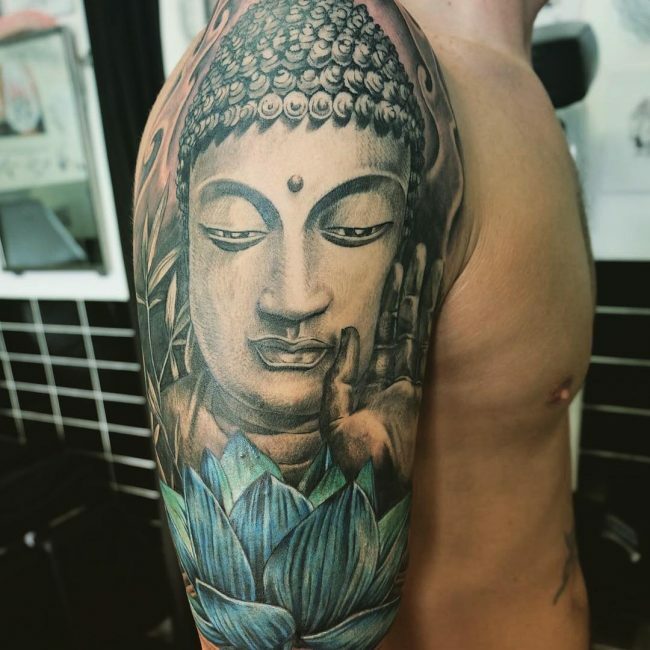 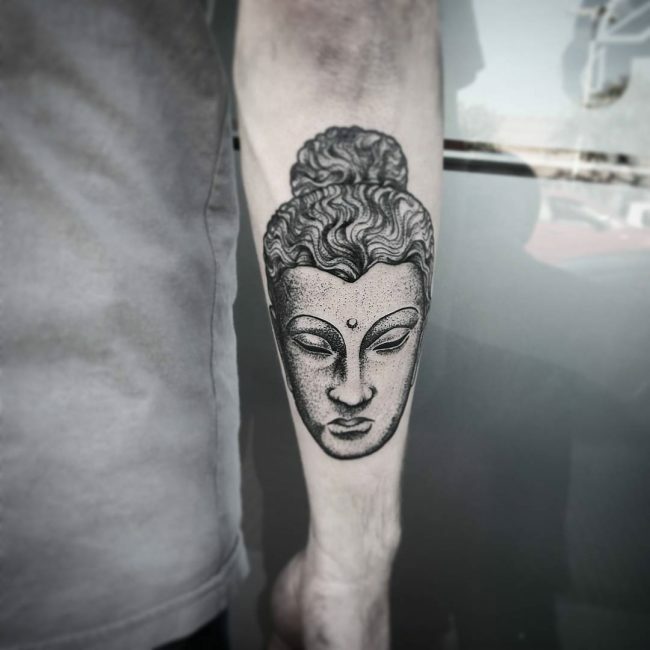 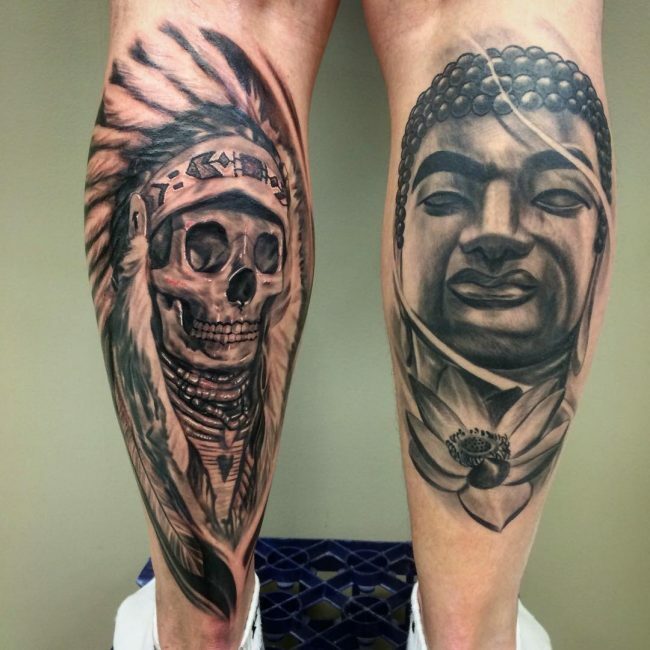 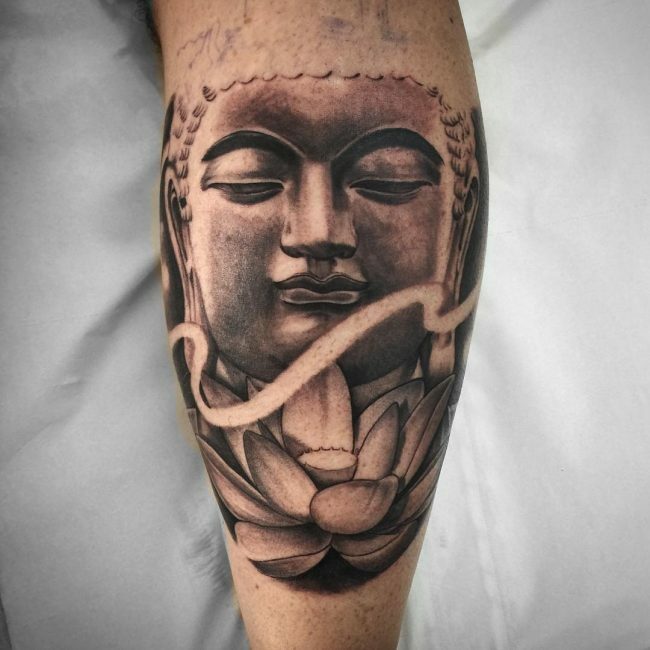 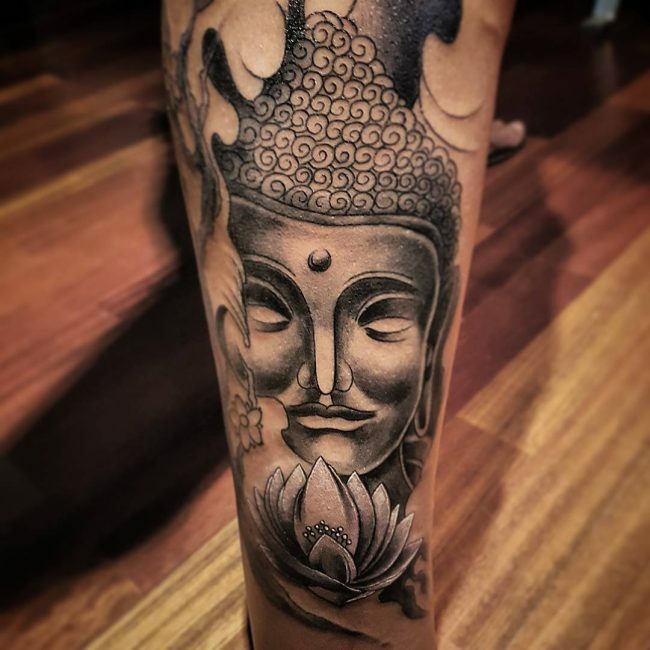 Buddha Face: These tattoos focus on the features of Siddhartha Gautama’s face and the way he looks calm and peaceful. 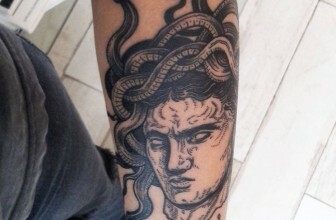 His facial features are balanced, and he is drawn with tight curly hair. 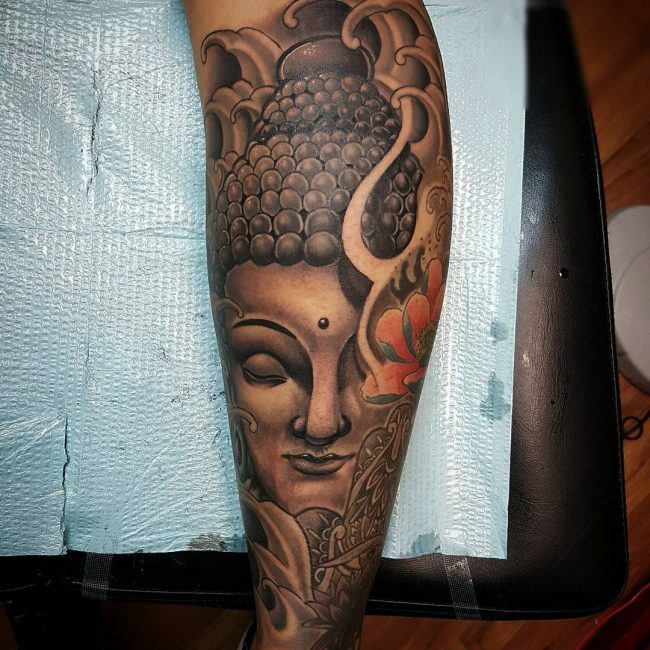 Meditating Buddha: Sometimes the Gautam Buddha is depicted in large tattoos in the meditative position, with one arm up and the other resting in this lap. 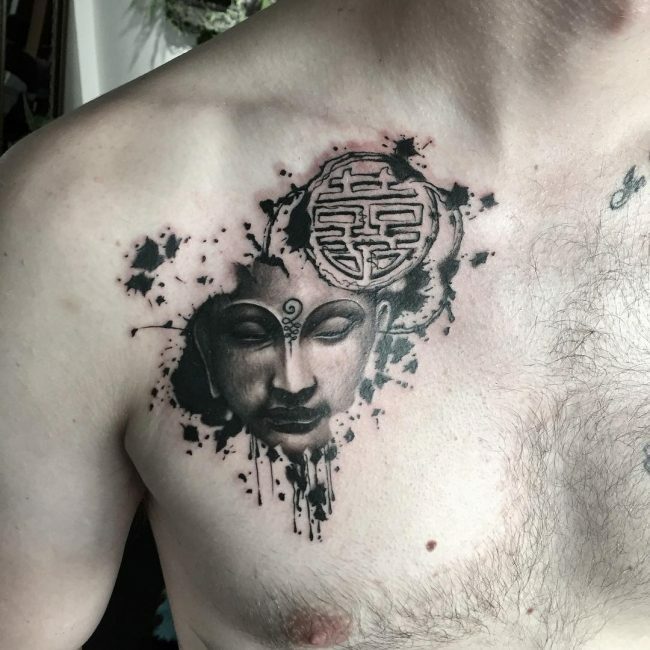 He may be drawn with a yellow “halo” around his head to depict his higher state of being. 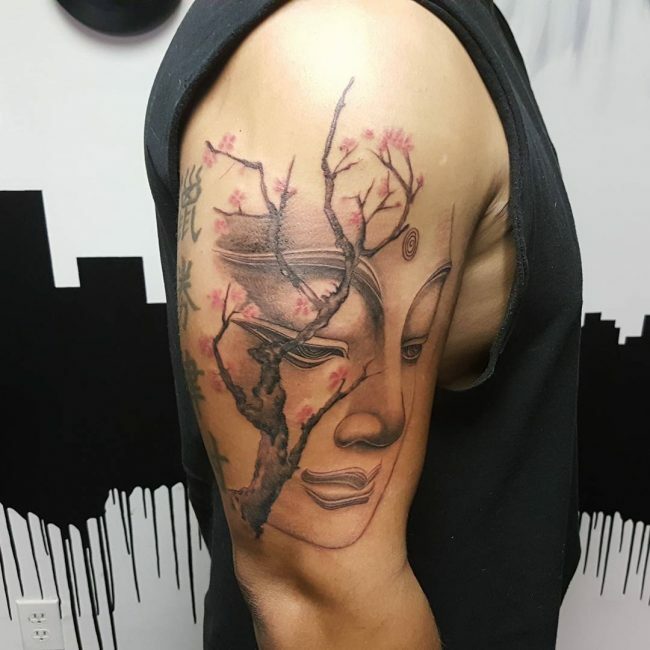 When you start looking around you will find many different types of designs, like some of those discussed above, that may appeal to you. 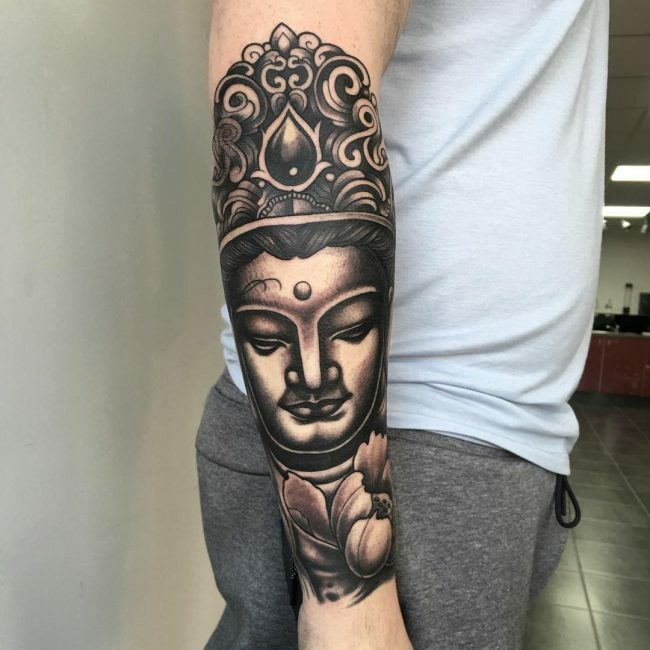 Choosing any tattoo is a big decision because it’s permanent and this applies even more so when choosing religious tattoos. 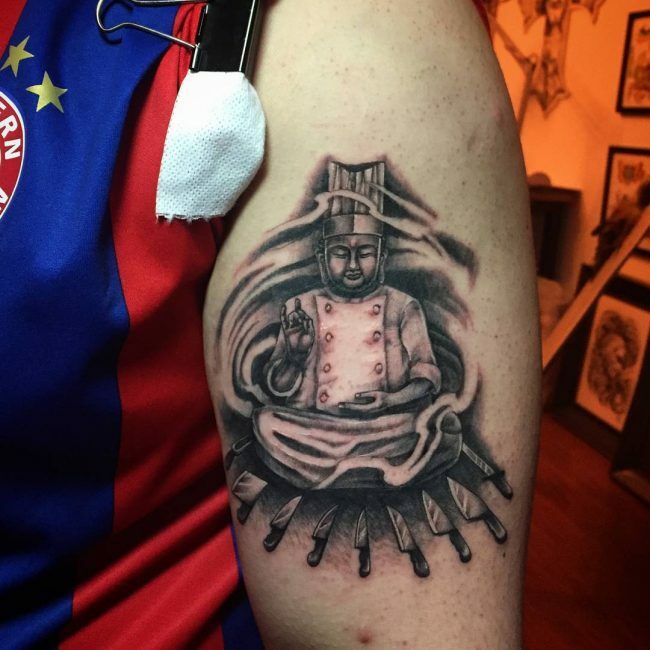 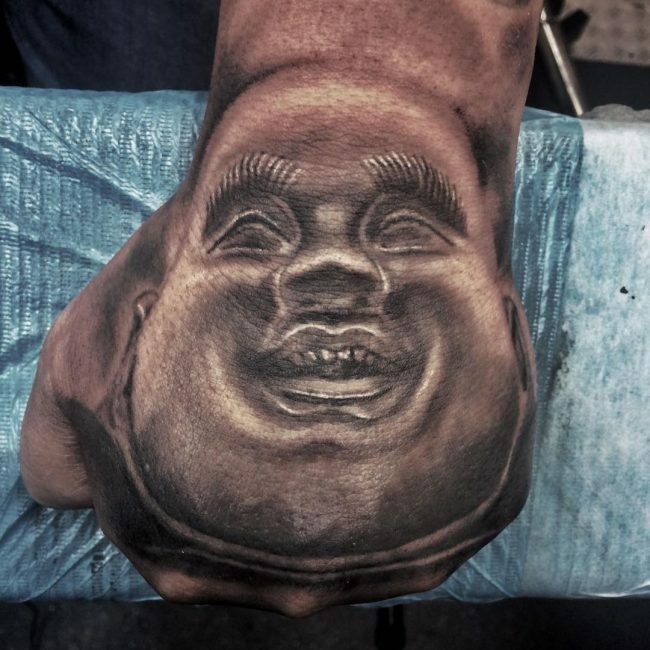 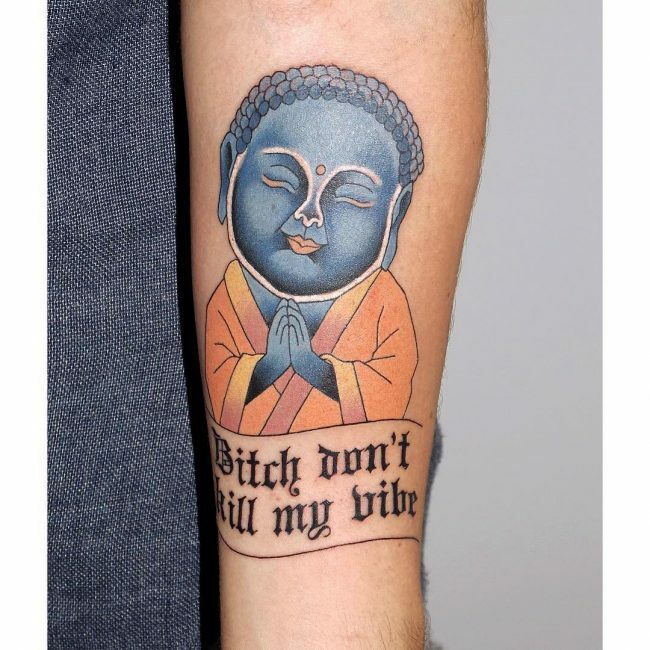 There should be a lot of forethought behind a tattoo like this, it’s not something you should ever get on a whim. 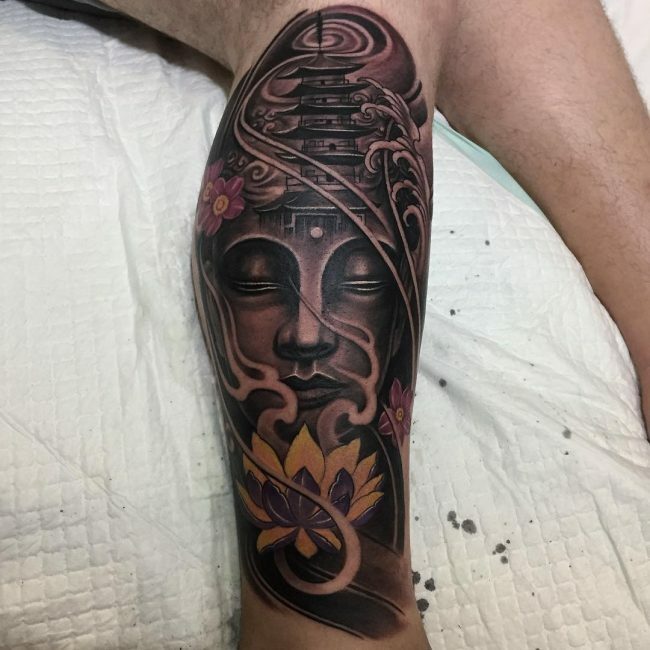 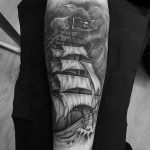 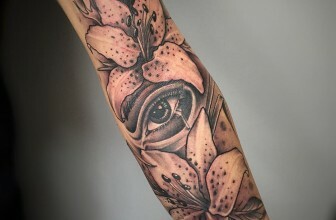 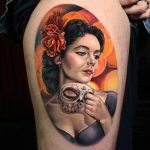 There are no rules about color in this type of tattoo, it is very much up to you to decide if you want a colorful piece – which will look striking – or a black ink design with shading, which can look just as impressive. 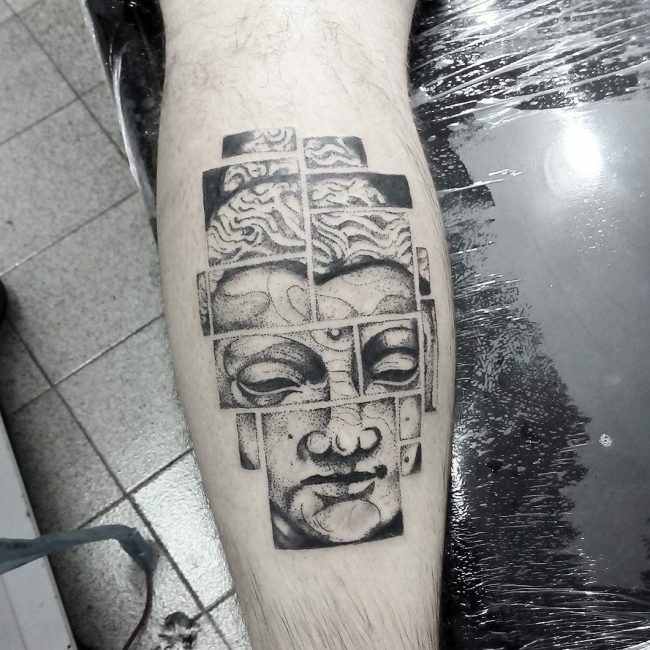 This is just one of those tattoo designs that will always look better as a big tattoo. 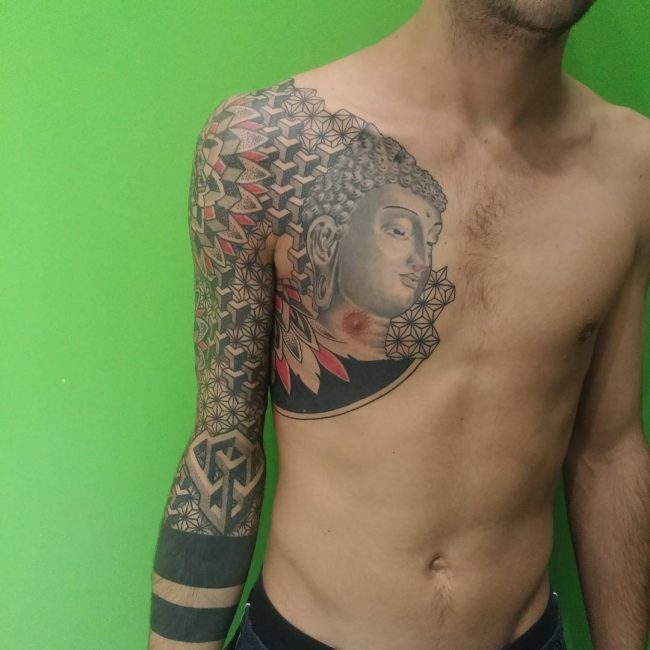 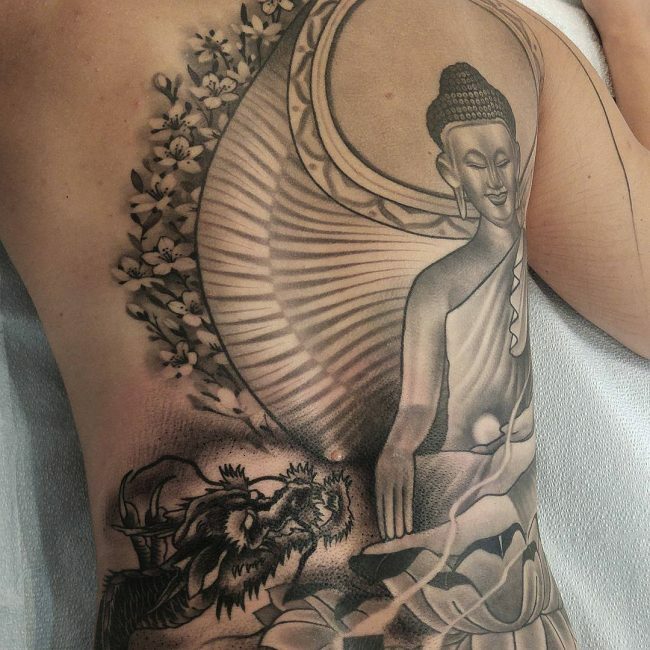 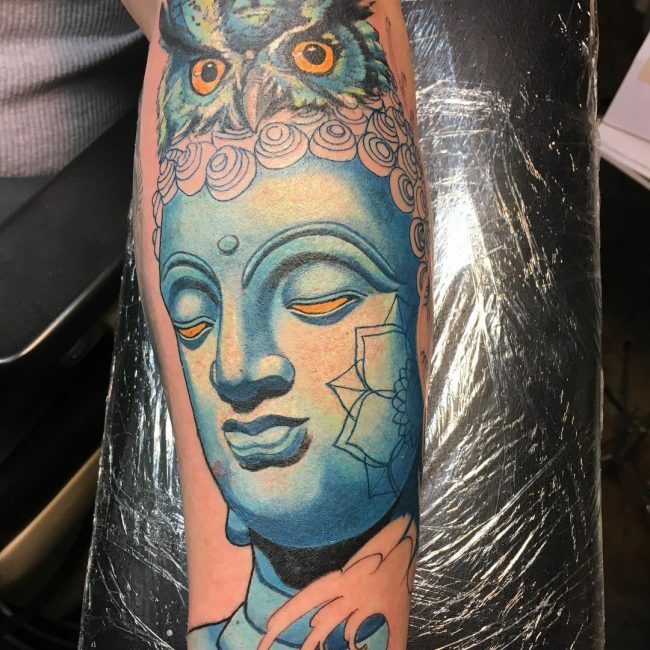 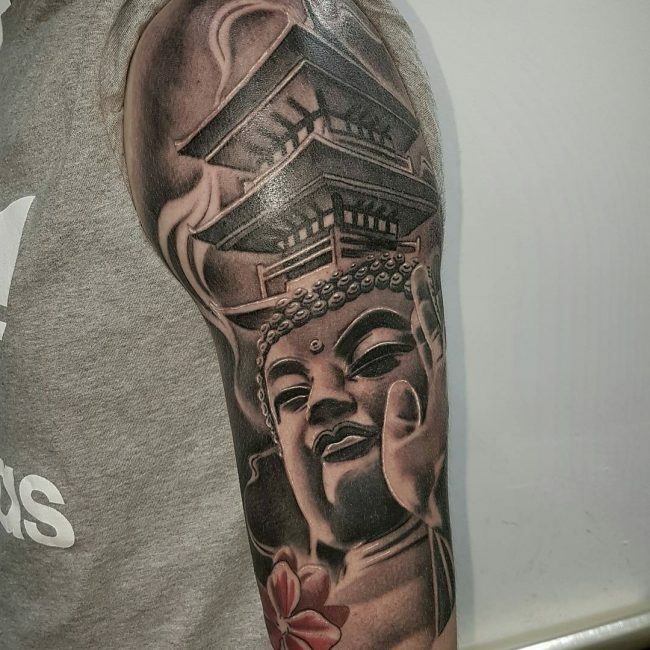 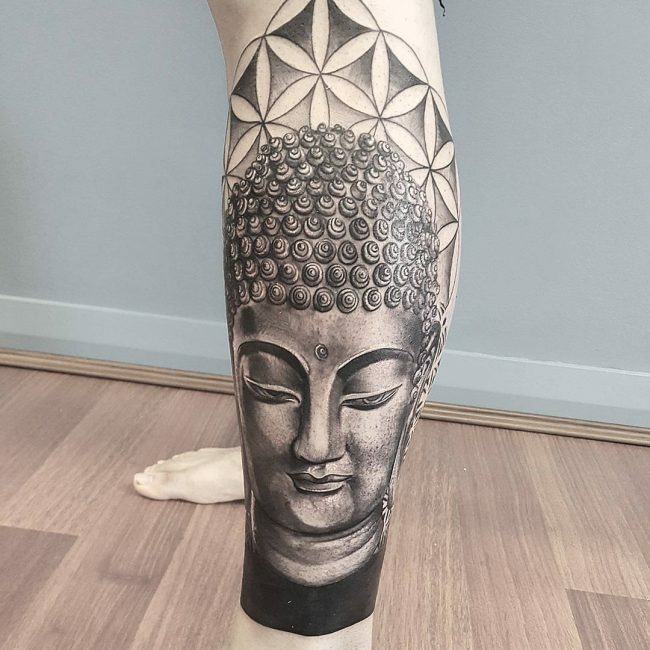 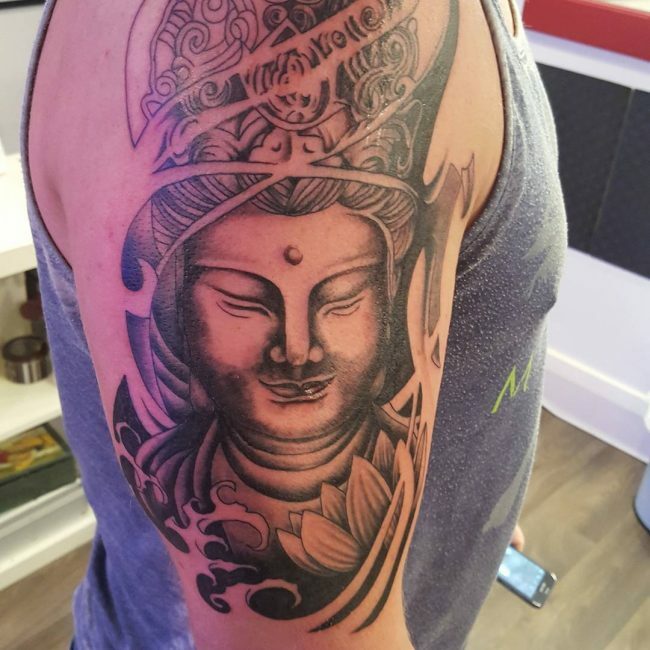 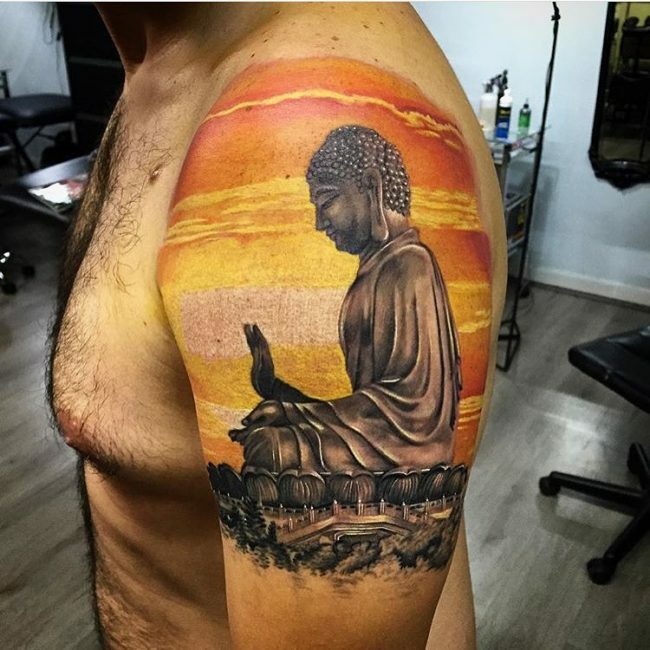 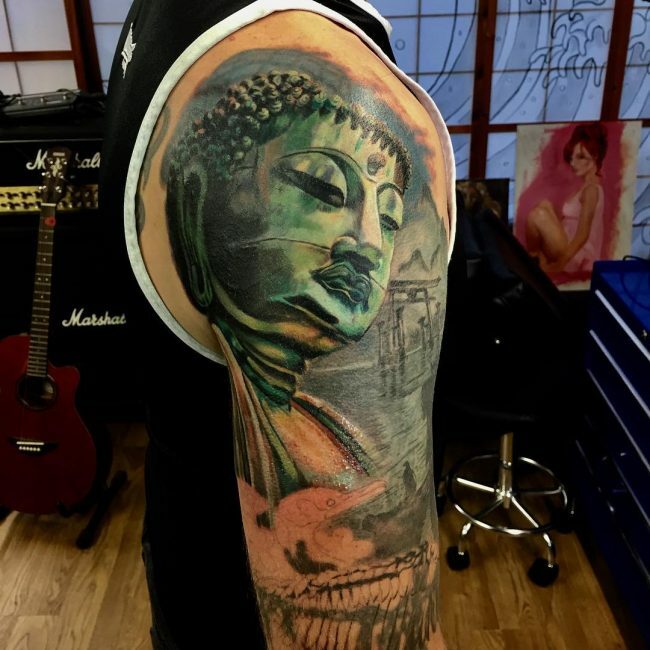 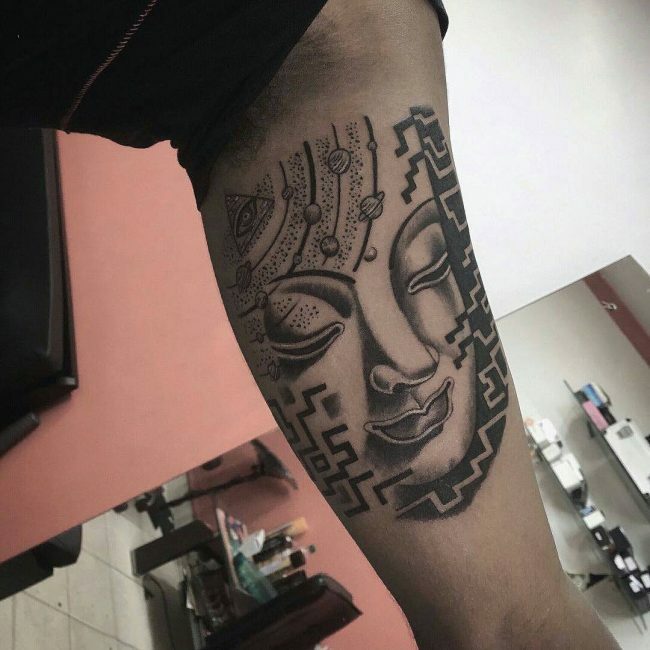 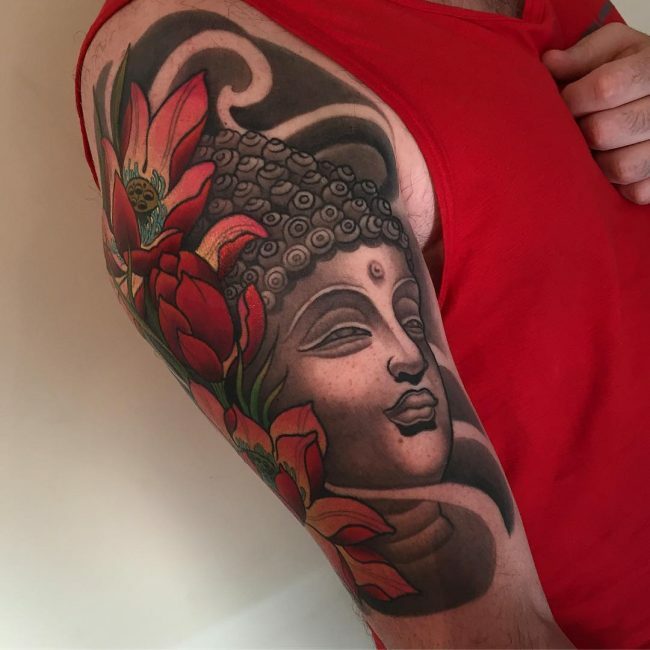 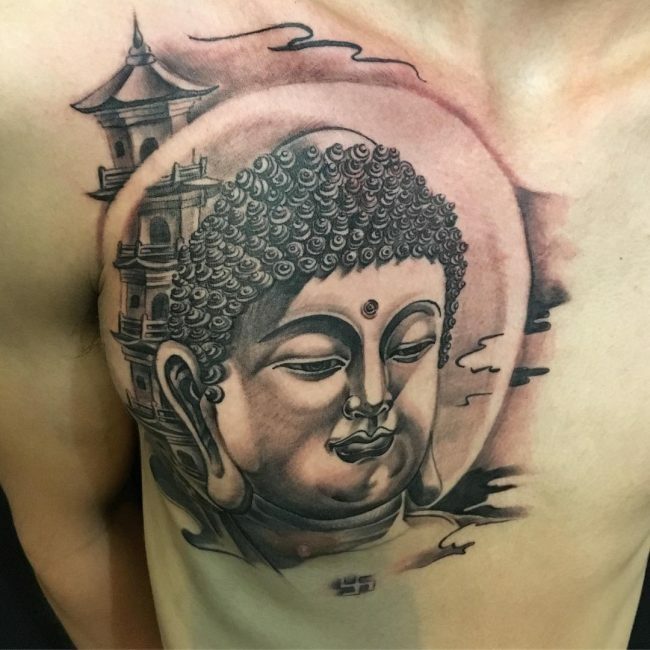 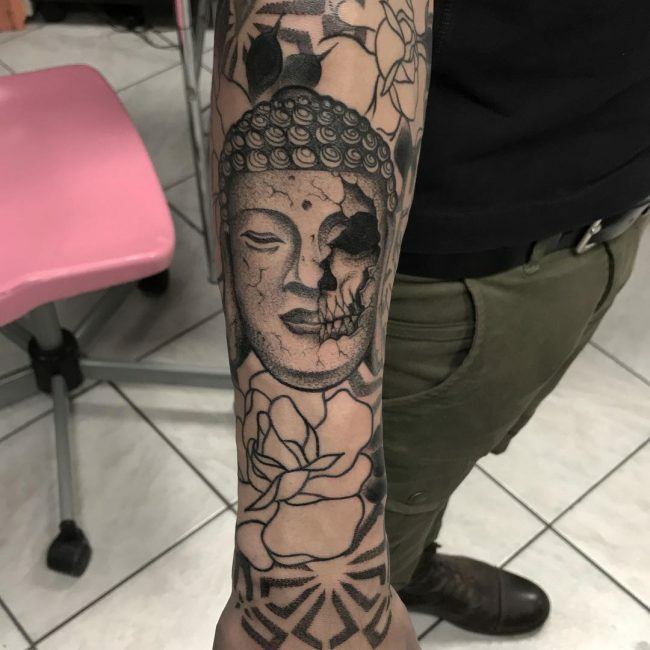 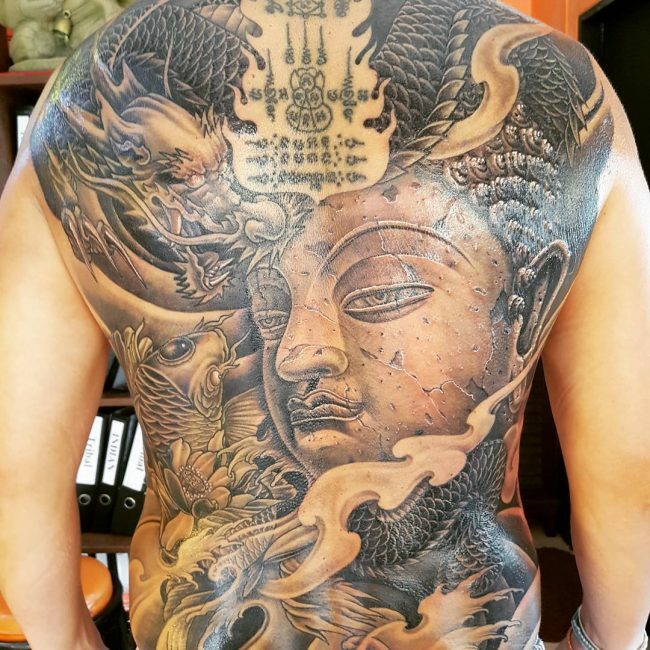 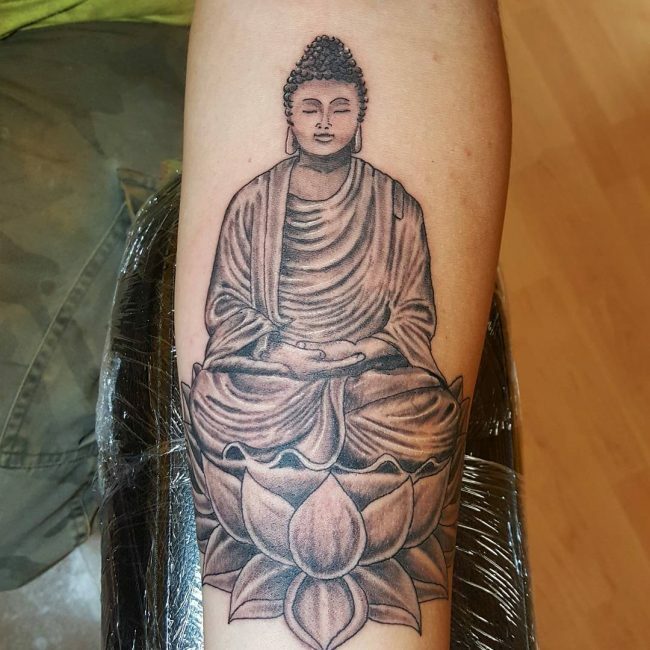 Lots of people choose to have their Buddha tattoos as full back pieces or use their upper arms, chests, or stomachs as a canvas for their art. 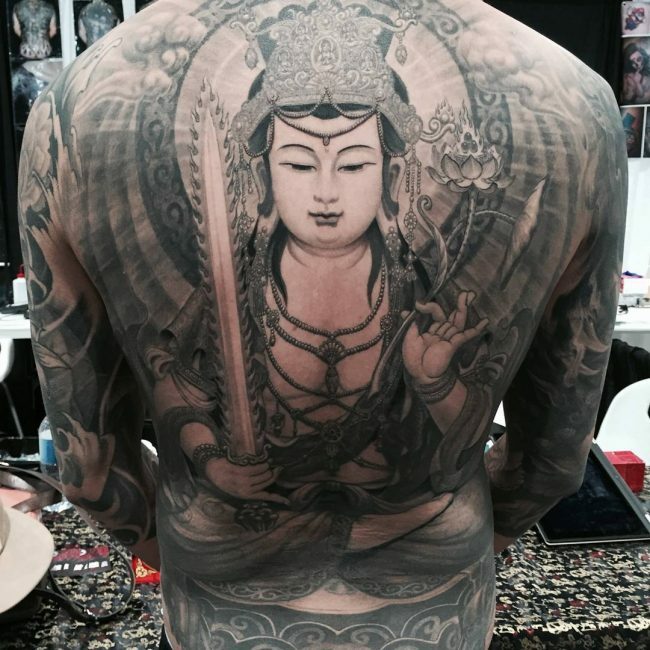 In these tattoos, there is often background as well, and sometimes additional symbols or subjects that relate to this practice. 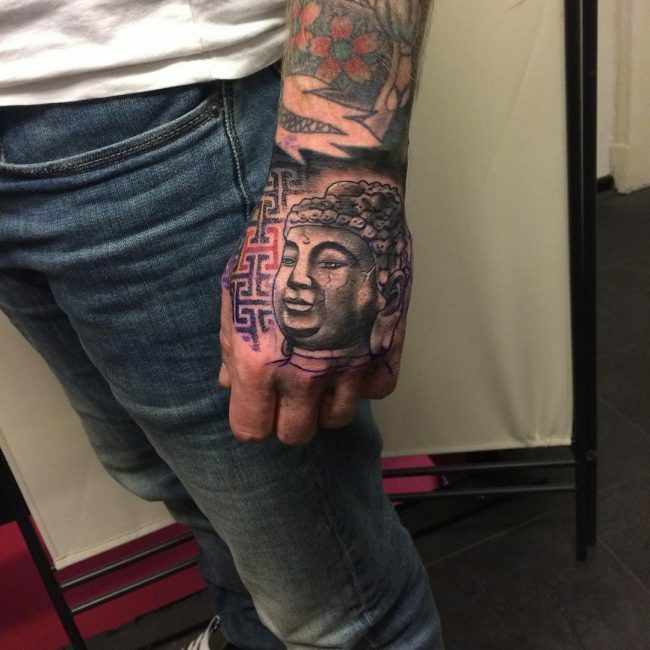 However, if you want something smaller you could go for a medium design as well, perhaps on the arm or hand. 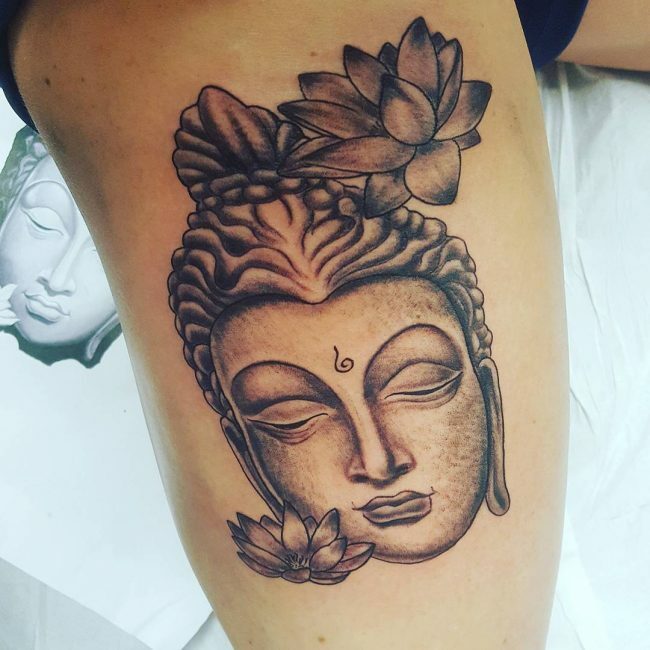 This tattoo is personal, a reminder to yourself and it helps if it’s placed in an area that you can see as well. 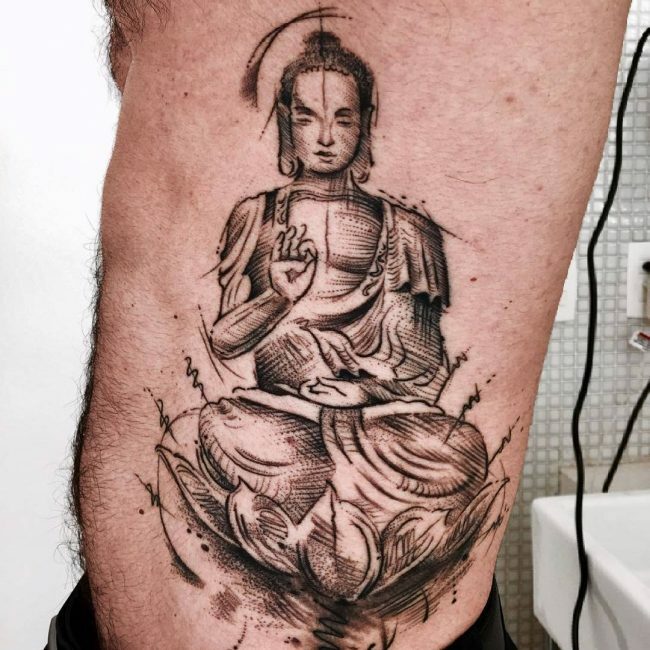 Those who choose to get a Buddha tattoo should always have an understanding of the origins of this figure, even if they are not Buddhists themselves because this tattoo is recognizable and people will ask you about it. 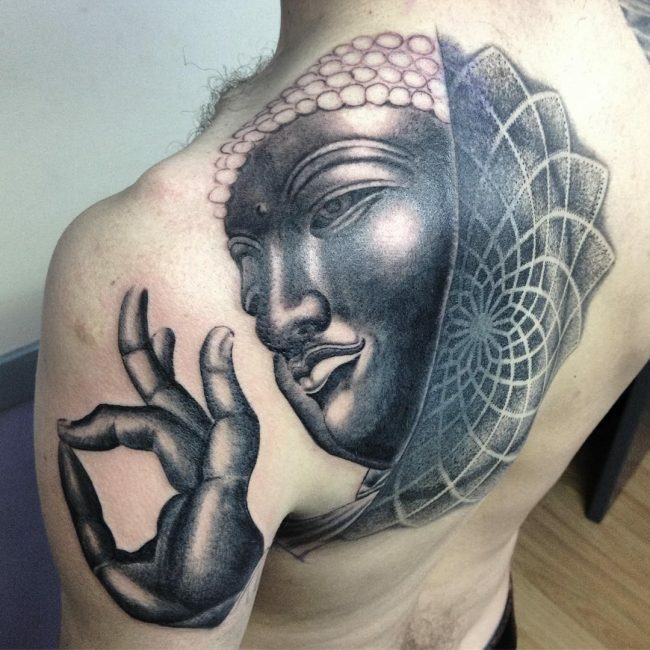 Once you’ve chosen a tattoo such as this it is your responsibility to educate yourself about it. 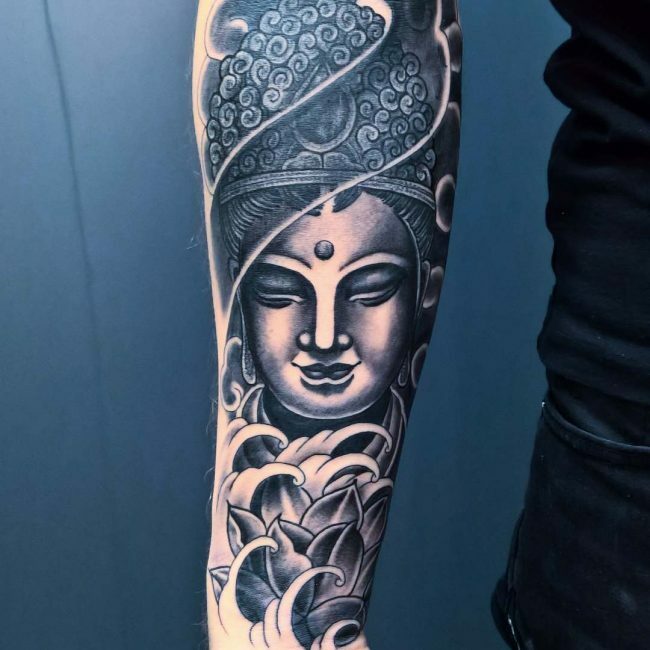 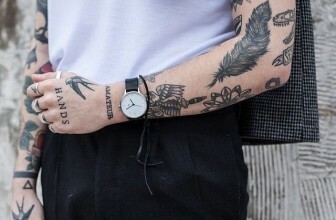 A tattoo like this not only looks powerful but it is also a strong reminder to try and live your life in a way that causes no harm to anyone else. 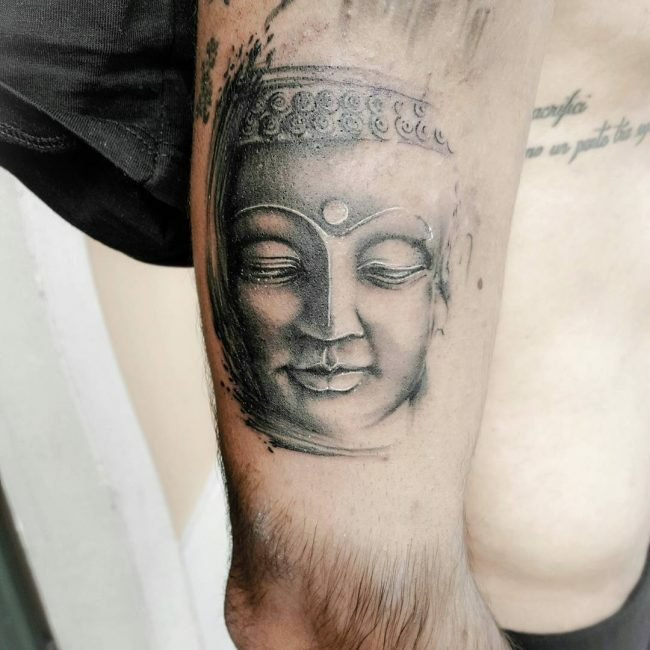 Your tattoo could serve as a reminder of the Gautam Buddha’s teachings and the way you try to live your life accordingly.